Does your dad still use AOL? It’s like, ugh, daaaaad, get with the times, right? Apparently he’s not alone. 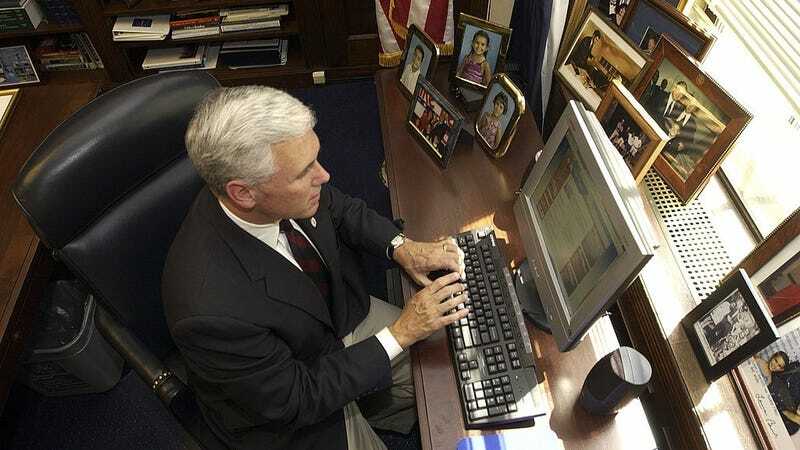 The Indianapolis Star reported last night that Vice President Mike Pence used his personal AOL email for official business when he was governor of Indiana, and that the email address was hacked. The paper reports that Pence’s account “sent an email to his contacts claiming Pence and his wife were stranded in the Philippines and in urgent need of money,” which it seems has happened to every internet user over the age of 50. Podesta was hacked through a phishing email. The email, supposedly from Google, told Podesta he needed to change his Gmail password; the link in fact led hackers to gain access to his password. An aide forwarded the email to the Clinton campaign’s IT staff, one of whom replied saying it was “a legitimate email” and that Podesta had to change his password immediately. The aide later said he had meant to type “an illegitimate email.” Everyone makes mistakes that have massive, catastrophic, world-historical consequences! Given today’s news, it might be a good opportunity to take your older relatives aside (or email them?) and remind them that Gmail is free, easy to use, secure, and not lame. *Update: Clarifies that Pence’s account, rather than Pence himself, sent the email claiming he and his wife were stranded in the Philippines.